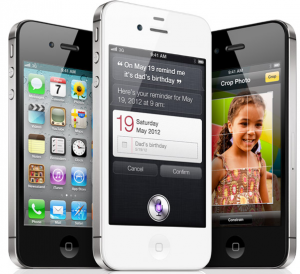 Today, Apple announced the iPhone 4S, a launch date for iOS 5 (Oct 12), the new Find My Friends app, the Siri personal assistant, and updates to the iPad Nano and iPod Touch. Here’s a roundup of links from today’s announcements and reactions from around the web. I won’t be buying the new iPhone 4S (I just upgraded to an iPhone 4 earlier this year) but I’m looking forward to the iOS 5 update. This post is over three years old but it’s still getting traffic, so here’s a quick update based on my experience. I’ve been able to access email from Exchange with the standard data plan. This is across three different companies over a 3+ year period. According to this post on a MacRumors forum, the only thing that the enterprise data plan provides you is additional help support – i.e. technically there is no difference. Today AT&T released details on their iPhone3G pricing plans for consumers. Many people are upset about the $10 increase on the data plan and the extra fees for SMS. I’m finding it odd that almost nobody is talking about the Enterprise Data Plan. According to the AT&T web site (click on the RATE PLANS tab), it will be $45 per month for “when using iPhone to access corporate email, company intranet sites, and/or other business solutions/applications”. If I’m understanding this correctly, I will need to pay a $15 per month premium over the consumer data plan (a $25 per month premium over the current consumer plan) if I want to take advantage of push email from my company’s Exchange Server. Is this right? MacRumors: Enterprise data plan NEEDED for Exhange access? Exchange costs $15/month more beyond that. The normal 3G iPhone data plan costs $30/month. Enterprise data costs $45/month. This buys you access to all the standard Exchange features. If you need to get Exchange mail, or access data inside your firewall, you’re an enterprise user. AT&T isn’t saying they’ll disable ActiveSync and Exchange on normal iPhone plans for non-corporate users so we’re unsure how they’ll police this policy. Our Christina speculates that the enterprise plan sets up the server to accept exchange support; you could do IMAP from your exchange account but if you want non-MobileMe push, you gotta be on the enterprise tier plan. AT&T said that if you’re using Microsoft Exchange ActiveSync to get your push corporate email, calendar and contacts, expect to pay $45 a month. That’s a bit of a bummer because it just adds another $15 a month if you’re just trying to get your corporate email. I’m successfully connecting to my company’s Exchange Server via ActiveSync on my non-3G iPhone running the 2.0 software. I made no changes to my data plan and everything is working just fine. AT&T will not be blocking Activesync. There really is no way to do it. 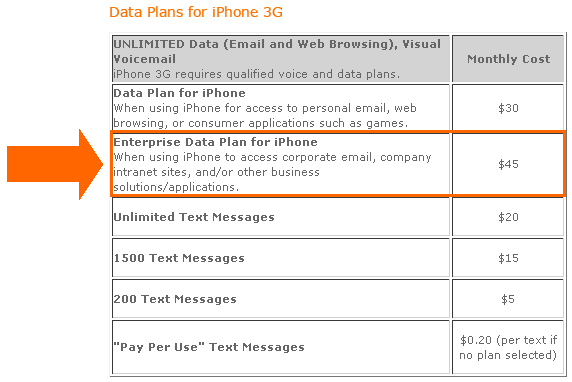 The $30 iPhone 3G personal data plan is the same thing as $30 PDA personal (for all other PDAs.) And the $45 Apple business data plan is the same as the $45 PDA business data plan. You can use Activesync on ALL AT&T data plans with windows mobile and Palm OS PDAs as of now. This includes $15 media net, $30 PDA personal, $45 PDA enterprise, $60+ laptop connect, even on all blackberry plans. So unless AT&T or Apple concocted some way to restrict activesync based on data plan specifically for iPhone, then it won’t be restricted. Furthermore there’s no reason to. Exchange Activesync is for personal use as much as it is for business use. The “business” or “enterprise” data plan for $45 will be required if you’re on a corporate paid plan, or if you have a business account. They will consider those businesses and require the business data plan. If you pay your own individual bill, you won’t be required to get the business data. If you call AT&T, they’ll tell you “yes, you must have the $45 plan” but those people are just repeating what they were told, which is flat our wrong. It’s nothing new, they’ve been doing it to AT&T reps for years. Maybe it’s that the people who do the training don’t understand it, or that they’re just being greedy jerks. I don’t really know. I’ve been following this topic closely for the last two weeks and I can assure you you won’t need the business data. I also know AT&T data plans and pricing very well and for several years and just based on what I know they won’t be trying to block it. Finally, the reason it’s so vague is for this very reason. They don’t want to come out and say “you can use exchange on personal or business” because they don’t want you to question them when they tell you you must have a $45 business plan to use exchange if you’re a business customer. They’d rather you just assume you need it and pay for it. A couple of people have commented here saying that they tried to get the 3G iPhone to work with the consumer data plan with no success. When they upgraded to the Enterprise Data Plan it worked. On the other hand, there are reports on various forums from people who have gotten it to work on their 3G iPhones on the consumer data plan.